For courses in Social Welfare Policy. Note: This is the bound book only and does not include access to the Enhanced Pearson eText. To order the Enhanced Pearson eText packaged with a bound book, use ISBN 0134303199. Comprehensive, current coverage of the history, issues, and forces that shape American social welfare policy. 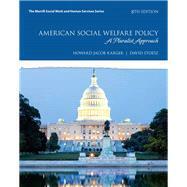 American Social Welfare Policy , Eighth Edition cultivates an understanding of both national and international social welfare policy. Using a policy analysis framework, the authors give students the background needed to grasp the social, political, and economic forces that shape social welfare policy, analyze the major programs that make up the U.S. welfare state, and discuss basic social welfare concepts. Updated throughout, the Eighth Edition examines the dramatic domestic and international events occurring since the previous edition that have impacted social welfare policy worldwide. Howard Karger is professor, Hawai’i Pacific University, School of Social Work. David Stoesz is professor, Flinders University/Carnegie Mellon University—Australia. Howard and David have been friends and colleagues for more than three decades. In addition to eight editions of American Social Welfare Policy , they have coauthored three other books: The Politics of Child Abuse in America (with Lela Costin) (Oxford University Press, 1996); Reconstructing the American Welfare State (Rowman and Littlefield, 1992); and with Terry Carrillo, A Dream Deferred (Aldine, 2010). Howard’s book, Shortchanged: Life and Debt in the Fringe Economy (Berret-Koehler, 2005) examines the financial practices and products that exploit millions of American families. The book won the 2006 Independent Publishers Award in Finance/Investment/Economics. David’s book, Quixote’s Ghost: The Right, the Liberati, and the Future of Social Policy (Oxford University Press, 2005), explains how conservatives have assumed control of domestic policy and proposes a new framework for social policy. Quixote’s Ghost won the 2006 Pro-Humanitate Literary Award. Who Makes Up the Poor? SNAP: Who Is in the Program, and What Does It Cost?